Today's card was created partly at the request of a follower on my blog and partly from my need for a card that follows a neutral color theme. My follower wanted to see one of my florals done in cream color which is no small task when it comes to me and watercolor. I have a hard time leaving enough "white" space all of the time, but I know this about myself so I started in with that fact in mind. I have a few thank you cards to make now that the holidays are over. I stamped the Mondo Magnolia, designed by Julie Ebersole for Ellen Hutson, using Versamark and Simon Says Stamp Ultra Fine Gold Embossing Powder and heat set it. This particular card stock is the Canson XL 140# Water Color Paper. I don't have much of this left and I probably won't buy it again simply because I prefer the soft white of the Canson Bristol Water Color Paper that I buy from Amazon or Hobby Lobby with a coupon. I also have some Fabriano Water Color Paper for my upcoming Watercolor Class that I will be taking at the end of January and it is also more cream colored than white. I really love the soft white of the Bristol Paper that I have been buying. I can actually buy it from Amazon.com for less than I pay with a 40% off coupon at Hobby Lobby. You can see it here: Canson Bristol 96# 11 x 14 - 25 Sheets. I know enough about what I am doing most of the time not to need the 140# version which will take a great deal more water than the Bristol does. With practice, you just learn to work in one area at a time and do your painting in multiple layers so the paper will not pill. There are a few places that make brighter white water color paper, but for card making, I'm good with what I'm currently using. If I ever get to a point where I'm trying to do fine art prints, I'll invest in better paper (*smile*). Using a water brush with a Tim Holtz Distress Marker in the color Antique Linen I colored the flower. I tried to keep the left side of the petals slightly darker by putting no color at all on the right side and trying to keep a bit more of the super sheer cream. Antique Linen is just the palest hint of a color. I tried a couple of other colors, but they just weren't the correct color family. I have a beautiful Magnolia Tree in my yard that we got a couple of years ago. We had so much rain last spring that even though we had lots of blooms, they didn't last long. Sometimes they didn't even last a half a day before they got pelted by the rain and knocked off. I did get to study and enjoy the blooms for those few hours that the sun was shining. I feel like my color is a very accurate representation of the color of my magnolia. I would like to have a Tulip Magnolia with its lovely pink blooms, but I think we'll see if we can keep the one we have alive first. Once I was finished water coloring the bloom, I went over it all with my Wink of Stella Clear Shimmer Pen. Once that was done, I cut the panel with the Sunshine Layers Scalloped Rectangle from WPLUS9 Design Studios. I applied that to an A2 Top Folding Card Base that I made from SU! Crumb Cake card stock. I die cut the Mama Elephant "thanks" sentiment and attached it to my scalloped panel using Ranger Multi Medium Matte which finished this card. I'm anxious to try to color the Altenew "Magnolias for Her" image using a similar technique (you know--a light touch) and that will most likely be my next project as I need a few more thank you cards. I try to make cards that are appealing but not overly fussy; Classic and Elegant is my goal. I hope you enjoyed this super simple card and if you did, please feel free to leave me a comment. Thanks for stopping by today and I'll see you again soon. I wanted to send a card to someone who lost their husband recently. I sent a card at the time, but I wanted her to know we are still thinking of her and that we know what a significant loss that is in her life. I always love the look of white on white cards and today was no exception. I stamped the rose from the Clearly Besotted Merci Beaucoup Stamp Set and the Hero Arts Acts of Kindness Stamp Set in Versamark for the greeting. I was told that yellow is a favorite color and since she lives in Texas, I thought of The Yellow Rose of Texas for this card using WOW! Metallic Gold Sparkle Embossing Powder. I have to say that I love that embossing powder. I also have the WOW! Platinum Sparkle Embossing Powder and both are just beautiful. I haven't had the chance lately to talk about the differences in embossing powders so since I was doing quite a bit of heat embossing for the granddaughters to watercolor today, I pulled out a powder that I haven't used lately. It was complete and total frustration as it takes forever to melt and I won't be purchasing any of that brand in the future. I don't think it is very nice to "bash" a specific product in such a public forum (a blog), but I can say that I will talk about the products I do like and why. That is just my personal policy regarding any of the products I talk about here. Besides the WOW! Metallic Gold Sparkle Embossing Powder, the Simon Says Stamp Gold Metallic Ultra Fine Embossing Powder is a favorite, even over Ranger Embossing Powder. It melts quickly and easily and is very fine for great detail in your heat embossing while being less expensive than some of the other brands. When the embossing powder doesn't melt quickly, it tends to really warp your paper during the heat setting phase. I won't throw this embossing powder away, but it will go to the back of my drawer for use only when I don't have a preferred brand which I hope never happens. Honestly, I thought maybe I hadn't remembered correctly at the time, but I did. It took about ten times longer to heat set that particular powder. Also the Simon Says Brand is twice as much powder for less or equal money so that is a win-win to me. I used Tim Holtz Distress Marker in Mustard Seed and Mowed Lawn for the leaves. I looked at using a few different markers or Clean Color Real Brush Pens, but I liked the warmer undertones of this yellow. Once I had watercolored the rose, I cut the panel using the largest Simon Says Stamp Stitched Rectangle die. I made a 110# Top Folding Card Base from Stamper's Select White from Paper Trey Ink. I am just trying this card stock for the very first time but I love the heavy weight and the smoothness of this card stock. I also think it is a good value for the quantity, quality and smoothness at $6.00 for 40 sheets. I've used Stampin' Up's Whisper White but the heavy weight is quite a bit pricier for fewer sheets. I would definitely try this card stock in other colors as well. As always, I added some sheer shimmer spritz to the panel once it was cut before adhering it to the card base using Tombo Mono Adhesive. The final Touch was Wink of Stella Clear Shimmer Pen. I'll be back soon with another project as I have a couple to finish up for another project that I was working on before Christmas. I sat down in my studio yesterday afternoon to create a card for a friend to let her know I've been thinking of her. I love this "Beautiful Day" Stamp Set from Altenew so for this week's Simon Says Stamp Wednesday Challenge I wanted to "make it sparkle". The easiest way I know of to do this is to use your Wink of Stella Clear Shimmer Pen instead of water or a water brush with a Distress Marker. This watercolor is super simple as I only used two colors to paint the image. I'm pretty sure I have never seen a flower in real life this color, but I adore it. I used Tim Holtz Distress Markers in Peacock Feathers and Mowed Lawn to color the entire image. I stamped the image using a simple mask to add the leaves. I used WOW! Metallic Platinum Sparkle Embossing Powder for the image and the sentiment from the Hero Arts Acts of Kindness Stamp Set. You might remember that Hero Arts created this for the November Jennifer McGuire Ink Share Handmade Kindness Challenge. The one thing I have learned since I started making cards is that people really appreciate getting a card in the mail so much. Especially in this day and age of texting and instant communication, it means a lot when you take the time to create something and send it in the mail. On my previous project, I could not seem to get it photographed accurately so I was happy to see that wasn't the case with this image. You can see all of the sparkle and shimmer on this card. I really think a top folded card photographs better than a side folded card which is why I usually make top folding cards. I used Canson Bristol 96# Watercolor Paper for this front panel and after coloring the image I spritzed it all over with with Tsukineko Sheer Shimmer Spritz. I really like the Bristol Paper because it is so smooth. Simon Says Stamp carries the Strathmore Bristol. However, if you haven't done much watercoloring, you'll likely want something a bit heavier to hold up to more water while you are learning. I also like the Canson XL 140# Watercolor Paper but it isn't as white as the Bristol. The Canson Bristol is a soft white while the Canson XL is cream colored. Once I had everything watercolored, I cut the panel with my all time favorite, Simon Says Stamp Stitched Rectangles in the largest size. For the super narrow border I am showing in this card, you end up trimming about 1/4 inch off one side of the A2 card base. That makes it fit my watercolored panel. As long as I use inexpensive card bases, then I can keep using better quality papers or watercolor paper for my front panels. Sometimes I will use my better quality paper for the card base, but those cards tend to be single layer cards rather than just a base card. I hope that makes sense. I have more projects on the way and it will soon be time to get some Valentine's Day cards made. Thanks for stopping by to spend a bit of time here today. I always really appreciate it when you leave comments so feel free to do so! Even though I did make a card today, I can't seem to get it photographed decently. I guess the colors I selected are more muted and just not that vibrant and the sparkle I added seems to be not that evident either so this is a poor representation for the Simon Says Stamp Wednesday Challenge which is "Make it Sparkle". Trust me, I'll try to do a better one. I wanted something similar to a card I made previously but thought I would go for a more "Chic" look so I started by embossing this Hero Arts Peace & Joy Stamp using WOW! Metallic Platinum Sparkle Embossing Powder and cutting it out with the WPLUS9 Love Showers Tag Die. I used Wisteria Wonder Card Stock from SU! and embossing the word "in" from the Winnie & Walter "The Big, The Bold and The Comfort" Set using the same embossing powder. The embossing appears to be just a dull grayish color, but it isn't! The A2 card base is Bazzill Marshmallow Card Stock with the front embossed using a Design Objectives Embossing Folder. It isn't as 3D as the Next Level Embossing Folders, but it is more than just a 2 dimensional look. I cut the stars from some old QuicKutz Dies that I had, the streamers from the Taylored Expressions Raise Your Glass Die Cut Set and the numbers from a number set by QuicKutz called No. 73. I put 8 strands of DMC metallic thread through the hole in the tag and did a slip knot. To make sure the numbers matched as far as the color, I inked up a piece of scrap card stock using Versamark and put the same embossing powder over it and heat set it. Then I cut my numbers. This particular color of embossing powder is a bit warmer than silver, so it was important to me to match it up and silver glitter paper just didn't do it. Additionally, all of the paper was spritzed with Tsukineko Sheer Sparkle Shimmer Spritz. To assemble the card I used a combination of Foam Squares and Ranger Multi Medium Matte. The tag and the bottoms of the numbers have foam on them while the top of the numbers have a bit of adhesive so they lay flat against the tag at the top. The streamers are adhered with Ranger Multi Medium Matte as well. The stars are also a combination of foam squares and liquid adhesive. Assembled, this card barely fits in the envelope and if I made it again, I would make it 4 x 5.5 to give it that extra bit of room. This card is side folding and I don't like it as much as the top folding version I had made before. But it's for my best friend and she won't have nearly as critical of an eye as I do. She just enjoys getting the card in the mail. Thanks for stopping by today. I already have an idea for my next card so I'll see you all soon! I'm going to have two of my granddaughters here for a few days this week before school starts again the next week, but I will be around. Be sure to let me know if you have any questions and I'll answer them for you. During a recent trip back home, my husband and one of my grandsons made a trip with me to see a family friend. We weren't sure that we could make it so I asked if last minute was okay with her and she said that was fine. I would have felt worse if I said I could be there and then not make it. When I had asked her the night before our visit if I could let her know in the morning, she put a brisket on to cook overnight in case we were there. I'm so glad we could make it to see her for a visit. It was our first time to visit since her husband had passed away not quite two years ago. I wanted to try out a new stamp and die set that I recently purchased from Ellen Hutson, LLC called "Mondo Magnolia" from the Essentials by Ellen Collection which was designed by Julie Ebersole. I love this type of line drawing that I can watercolor and this is my favorite of the ones I have, measuring 3.75 x 3.75 inches. I had also recently purchased the Simon Says Stamp Thanks Scallop Border Die and wanted to use it to send a note thanking her for the visit and for feeding us some of her home cooking, which is always so good. I stamped the Mondo Magnolia with Versamark and heat embossed it using Simon Says Stamp Ultra Fine Detail Gold Embossing Powder. I really love the Simon Brand Embossing Powders because they melt quickly and smoothly. Next I cut a Simon Says Stamp Stitched Rectangle in the largest size out of Gold Foil Card Stock. After that was cut, I laid the Thanks Scallop Border Die along one edge of the widest side of that rectangle in the bottom third. Just as in photography, you want to try to use a rule of thirds in card making. The border die is wider than the rectangle so it gave the panel the decorative edge. With the gold foil card stock and the gold embossing powder, this made for a quick and easy card. I spent a little time watercoloring the bloom, but I enjoy it so I had it ready to make a quick card. I used one of my favorite Distress Markers in Seedless Preserves. This color goes down very purple, but once you add the water to it, it gives lots of shades of pink and violet. I call this color "my little extrovert" because of the way it behaves with the water added. All of the distress inks do this but none quite duplicate the behavior of the Seedless Preserves. As a person who loves pink and purple, I love the variations in tone and depth achieved with this particular color. If I want my image to look more pink then I use a bit more water. If I want more purple and less pink, then I use less water. There's not really a right or wrong way to do it. I just add layers of color until I achieve the desired look. To me, that is relaxing. And if you know me, then you know that there is not too much that I am relaxed about. It's a lot of fun for me to use the various watercolor mediums that I have and learn how each of them behaves. Distress Markers and Zig Clean Color Real Brush Pens are the most alike, but still a bit different from each other. The distress markers give you somewhat predictable color but the pens are such an intense amount of that color that they seem less predictable. I also use Reinkers or Distress Stains to watercolor with but the thing about the markers or pens is how portable they are. I can haul them around in a small tote with a water brush and some pre-stamped images in very little space. That is not something I can say about my ink pads. I would encourage you to try all of the mediums that you have so you can learn their behavior and which gives you the most satisfactory results. Also, be sure to use watercolor paper when you do this because regular white card stock just doesn't cut it. When I started, I merely wanted something that looked passable and that I wasn't embarrassed to send. Watercolor has become so much more to me. We have been traveling, first to Kansas and then to Dallas, for a week and I was so ready to be home this afternoon. I really crave the creative time in my studio to kind of decompress and I wanted to get a blog post up today. Now that I can access my studio again, the creative juices will start flowing. I don't really let myself think about what I might make next when I can't access it because then I just get frustrated. I have several upcoming projects including some pre-class homework for a class that I am taking in January so I have lots to share and create. Thanks for stopping by today. One of my Sisters-in-Law retires today after more than 30 years with the same law firm. We were up there this past weekend for the Finger Christmas as my husband and I were the hosts this year so we stayed an extra day in order to attend a reception on Monday in her honor. It was a nice surprise for her and a joy for us to be there for a little while to honor her and her dedication and celebrate her retirement. I get so much absolute joy out of creating and designing cards. She seems to realize this and since she loves handmade cards she is not hesitant to ask if I'd like to do it and I love that I can do this for her. So I sat down yesterday to make a set of one dozen thank you cards with two masculine versions included. I started by "painting" several (9) watercolor backgrounds using Gansai Tambi Watercolors. I stuck with blues & greens, pinks & corals and a smidgen of violet in there as well. I really just wanted a mottled background and wasn't going for any particular pattern as I planned to die cut the panels for the cards I had designed. I was simply putting down a layer of color. I did all of this on Canson Bristol 96# Watercolor Paper and a Silver Black Velvet #8 Round Brush. I kind of just dabbed at it using 2 colors per background and some spritzes of water so they could blend into each other. In an effort to speed up drying time for the next layer of color, I used my heat tool to dry these panels. Once those were dry, I did another wash of color over each panel in the same random way using my Finetec Mica Watercolor Paint Set. These paints come in a set of 6 and contain Mica which is a shimmering mineral used to give these paints their shine. It goes over the color wash giving your project a beautiful shine. Since I did mine in "dabs" it gave the panels a marbled look. One little tip about using the Finetec Gold Watercolors is to save the water that you rinse the brush in. It will be loaded with more of the gold mineral to give some shine to another project later. I try to keep the water to a minimum so that it will evaporate fairly quickly. When I want to use it again, I put a couple of spritzes of water in the glass to get it moving again. These paints can also be used on dark card stock with great results unlike traditional watercolors. Once I had all of the backgrounds completed, I die cut 9 hearts out of those panels using the Little B Hearts Designer Cutting Dies in the 2nd to largest size and with the stitch impression. You can have it with or without. I like that added detail. I also really like the shape of these hearts for many of my projects as they are what I call "fat hearts". I have a couple of other sets of heart dies, but they are smaller and/or tall & skinny. I just use whichever set best fits my needs on whatever project I'm doing at the time. Since I was doing mostly horizontal cards, I could use the "fatter" style. Using a piece of Post-It tape to hold the die in place on the hearts, I cut the "thoughtful" from each one. These cards use a Stamp Set called "Being Classy" from Concord & 9th that I really love. There are also accompanying dies. I used a temporary adhesive to hold the top and bottom pieces of the heart in place on the card front while I stamped the word in the open space. It fits right in using this technique. I used the same design from this post for most of the cards and heat embossed the "So thoughtful" using WOW! Metallic Gold Sparkle Embossing Powder. For the two masculine cards, I cut the banner from the scraps of the heart panels and punched it with a banner punch I have that came from Stampin' Up! That punch makes quick work of banner tails a.k.a. swallowtails. I heat embossed those cards using WOW! Rich Pale Gold Embossing Powder so they would not sparkle. Something tells me that "Sparkle" isn't important on a man's card. You definitely have to use your Powder Tool or Powder Pouch for this technique. I have one of each but I like that you can refill the Powder Tool when it gets low using corn starch or baby powder. For the accents, I cut several of the Simon Says Stamp Mini Hearts from Gold Glitter Card Stock scraps for a variety of sizes and shapes. Although you could cut these hearts apart, I have left mine intact so that I can cut several at one time and in one pass in my Cuttlebug. It's a matter of personal preference is all. I've said it before, but it bears repeating; it is critical that you swatch your paints when you receive them so that you can see what the color looks like with the water added. I cut a piece of watercolor card stock that would fit in the lid of this set and made swatches with labels under each one. They are just paper labels. I do make a lot of labels on my P-Touch Label machine, but I didn't see the necessity for these since they are a consumable supply. Now you all know how I love to add sparkle and shine to all of my projects, so this group of cards fits right in with the "Make it Sparkle" Challenge over on the Simon Says Stamp Wednesday Challenge. I hope you enjoyed today's project and I'll be back after Christmas with my next project. In the meantime, have a very Merry & Wonderful Christmas. Thanks for stopping by today! Today's card came from an idea that I saw on Pinterest and is somewhat inspired by Joanna Gaines, The Magnolia Mom. You might recognize the name from HGTV's Fixer Upper. She does such a lovely job on all of the homes she decorates and they are heavily influenced by chalk and distressed looks. I personally don't like the look of brand new furniture that has been sanded to make it look distressed, but a lot of the things she does with metal and chalk boards, etc. is pretty fun and since it isn't my furniture, I like it! So when I saw this style of a card on Pinterest, I pinned it to come back to later. This is the inspiration card created by Betsy Veldman for Paper Trey Ink. Betsy has a video for this on YouTube so I watched it a couple of times. I don't have the same stamps that she does, but she gives a couple of tips on how to find a style in something you already have which is what I did on my card. I started with a 4.25 x 5.5 inch piece of cardstock in Lost Lagoon which is the perfect green chalkboard color. I do have some black chalkbooard paper, but I want to try this technique a few more times before I try it on that paper. I had one more Christmas card to make that I will be hand delivering later today and I didn't start on this until kind of late last night. So with the lateness of the hour, I didn't really look through my embellishments to add anything. But I'm okay with the Clean and Simple style of my card. I selected a flourish from an unknown maker set I already had. I'm pretty sure it was a Fiskars Stamp Set but the packaging is long gone. I stamped the flourish in Versamark on the top and bottom of the cardstock and then the greeting that came from the WPLUS9 Holiday Greetings Stamp Set. I put my greeting at an angle as Betsy did. I sprinkled it with white embossing powder and heat set it. Next I took a White Prismcolor Pencil, my see-through ruler and following the line of text on the bottom of the greeting, made my bottom "banner" line. Then I moved my ruler up, keeping my angle identical (which I could see through my clear ruler) and made the top banner line. I loosely colored in some of the white on the banner around the greeting to make it seem like chalk dust. I went all around the edges of the card stock piece with a sponge dauber, using the Lost Lagoon ink in a circular motion just to add some depth to that panel. 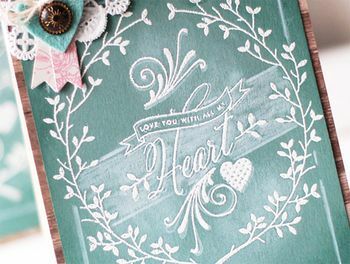 Next I took a piece of dry paper towel and just tapping it onto my craft white ink, gently swiped areas of the card to make that seem like chalk dust as well. I took a couple of the smallest snowflakes from the Simon Says Stamp Lots of Snowflakes and added a few in here and there with Versamark and heat set them with white embossing powder as well. Once I had that done I cut that panel with the largest Simon Says Stamp Stitched Rectangle and adhered that to my card base. I cut a Simon Says Stamp Eliza Snowflake and attached that to the card, trimming off the excess from behind with a pair of scissors. I'd like to try this card again after Christmas using my Craft White Ink and clear embossing powder to see if I get a better quality embossing. I think my white embossing powder is not a fine detail powder, and I know my clear is so I will try this again when I have a bit more time to put into it. My card is not as good as Betsy's, but for the time I had, I think it looks pretty good. Also, I don't always get something right the very first time I try, but I had enough right here to go ahead and finish it. I know my friend will really like it as she likes the distressed, vintage look and feel of things. Have a great weekend everyone and I'll be back soon with another project to share with you. Every time I see this image, the thing that pops into my head is "The best way to spread Christmas Cheer is singing loudly for all to hear!" These sweet little birdies just look like they are singing! I used this Stampendous Winter Birds Stamp for yesterday's card, so I'll just tell you the supplies I used to create it without going in to too many technical details. For the branches I used Tim Holtz Distress Marker in Pine Needles and a Zig Clean Color Real Brush Pen in Green so I could get the super fine lines in my coloring of the branches. For the Birds I used another combination of Distress Marker in Pumice Stone and Zig Clean Color Real Brush Pen in Black. For the winter gear I used Zig Clean Color Real Brush Pen in Persian Blue along with Tim Holtz Distress Marker in Wilted Violet. I also used a tiny bit of Zig Clean Color in Light Pink for the cheeks. After I had finished water coloring the image, I put Wink of Stella Clear Pen on the snowy parts then let that dry for a few minutes. Next I added the Glossy Accents to all the snow and to the pom-poms on the birds' winter gear. While that was still wet, I put a pinch of Elizabeth Craft Cool Diamond Silk Microfine Glitter on top then set it aside to dry overnight. I love the extra bit of dimension this adds to the card and it sparkles and shines like real fresh snow does. It's hard to tell it's there in the photo, but if you try it you'll see that it does. I created a card base with a piece of leftover Green Shimmer Card Stock so I also cut a white panel to go on the inside of the card for my message. This was a quick blog post but if you have any questions, just put them in the comments below and I'll send you a reply. Thanks for stopping by today. I'll be entering this card over on the Simon Says Stamp Monday Challenge Blog and I hope to see some of you over there. The card I have for you today uses one of my favorite techniques which is Watercolor using markers/pens. I started with a piece of Canson Bristol 96# watercolor paper and the Stampendous Winter Birds Cling Stamp which I stamped and heat set using Simon Says Stamp Fine Detail Gold Embossing Powder. I happen to buy this particular type of watercolor paper at Hobby Lobby using a coupon most of the time. I started coloring the birds using a Zig Clean Color Real Brush Pen in Brown for the body and Mid Brown for the Belly. Then I decided I should probably look at a picture so I googled "Winter Birds" to see some images. My images are not lifelike at all, but it's okay. I went ahead and colored them for my Mother-In-Law who just loves seeing the birds and flowers no matter what time of year it is and she won't care whether or not they are realistic. I like this particular watercolor paper a lot because it is so smooth, yet affordable for card making. It costs me about 6 cents per panel if I get at least 6 panels out of one 11 x 14 sheet. I also like the Canson XL 140# watercolor paper but it is more cream than white and sometimes I just want the nice soft white of the Bristol. It's all a matter of personal preference. However, it will pill up if you work it too much or with too much water so I grabbed a Distress Marker in "Pine Needles" and started working on the evergreen branches in the image between the layers of brown on the birds. I tried to keep moving so I would not make the paper pill and just went back and forth to different areas each time. It's very helpful if you aren't working on adjacent areas at the same time. I wanted some fun color for the little birdie's winter gear so I just did each color layer back and forth on the two birds until I had them all colored with the red, blue and green. One of the particularly nice things about the Zig Clean Color Real Brush Pens is that they have a super fine brush tip so they can be skinny mini or quite a bit thicker depending on how soft or hard you press with the brush. You don't need to have all 80 colors of these pens because you can make lighter or darker versions of all of the colors. I think I have about 48 of them now (I originally purchased a 36 set) and I don't really feel I have any missing at this point. There are lights and darks in each color so you can pretty much do anything you need to. Many graphic artists use the Zig Pens to color with and they are not using any water, so that should be a good indication of how "juicy" they are. Once I had the image colored, I went over the white snow and the pom-poms on the bird's winter gear with my Clear Wink of Stella Pen. Then I added the greeting in Versamark and heat set it with WOW! Primary Apple Red Embossing Powder to go with the striped card base I had chosen. I cut the watercolor panel using the Simon Says Stamp Stitched Rectangle Die in the largest size which is slightly smaller than 4 x 5.25 inches. I still wasn't too happy with the appearance of the snow or the pom-poms so I added a layer of Ranger Glossy Accents to them. Then I sprinkled just a pinch of Elizabeth Craft Cool Diamond Glitter on top of that while it was still wet to make it really sparkle and shine. Now I like it (giggle) and it fits the Simon Says Stamp Monday Challenge for this week. Thanks for stopping by today! Please feel free to leave a comment or question if you do. So I'm still on a card project for someone and I'm having a super creative kick with this gorgeous paper that I picked up at Hobby Lobby yesterday. Maybe I should preface this by saying that this paper is not a high quality, archival paper that you would want to use in a scrapbook, but if you are a card maker, it adds a luxurious touch easily. I could obtain a similar look by using a striped stamp and embossing with gold embossing powder but you would not be able to equal the shine without a lot of work and I'm not sure you could ever achieve it without having a Minc machine. For background panel, this stuff is fantastic, ready to go and the price was great. There were also several colors included in this paper pad; deep blue, orange, teal, and even white are among the papers colors. At .125 cents a sheet which equals $.04 cents per panel it's a fast and easy element to add to a card. I think the supply I have will last a very long time. If you think about it, there are approximately 320 panels in that one pad of paper, so I have months and months of card making pleasure in that one pack. I like that these papers are perfect to add an elegant touch to any project you might be working on. Once again, the card is very clean and simple to make. I cut my favorite Simon Says Stamp Stitched Rectangle for the background layer of my card. I seem to never tire of this die and I always love the crisp edges of a die cut. My Cricut just can't equal the crispness. Since I was creating a birthday card I wanted a bright festive color and this Kelly Green was just the ticket. Throw in one glitter paper balloon that is super sparkly and you have a quick and easy birthday card. The Wish Big Die came from Paper Trey Ink and I put a vellum panel behind it so that it wouldn't be competing with the background panel when you read the sentiment on the front. This particular vellum is a 40# Bazzill Vellum. I'm still working on the Secret Sister project and I need to have it done by the end of the week, so quick and easy is just the ticket. I adhered the background panel using Tombo Mono Adhesive tape runner and everything else using Ranger Multi Medium Matte. I like the placement of this element on an angle rather than being straight and it was the best way to accomodate the balloon. I tied some gold wire around the tail of the balloon and taped that down on the back of the background panel with a bit of Washi Tape. I have one more card to make for this set of cards, so look forward to seeing some orange. That's a color I rarely use, but Halloween definitely calls for it. And if there's a way to add a bit of bling to the project? Well that's just grand then! Thanks for stopping by today! I'm working on a requested project right now that has had a few challenges but has mostly just been fun. A couple of ladies I know are in a Sorority and they have Secret Sisters in this group. I looked everywhere I could think of to find some kind of stamp set for Secret Sisters with no luck at all. I've done a Secret Sister thing through my job in the past and I know how difficult it is to find anything for that specific purpose. Finally, I had a custom stamp made that has "Secret Sisters" in a nice font so that I can pair it with other stamps and dies to make some customized cards. I made a trip into town yesterday to pick up a pad of my favorite watercolor paper which is the Canson XL Bristol 96# paper. I buy it in a 9 x 14 pad and cut my own panels out of each sheet. That is the most ecomomical way to be able to use it since I am getting 6-8 panels out of each sheet. It costs about $.36 for each sheet when you use a 40% off coupon and then I get a minimum of 6 panels out of it making them just $.06 each. While I was in there, I noticed that they had all of the Paper Studio line (Hobby Lobby's own brand) at 50% off so I went in search of a paper pad that I saw a few weeks ago, but thought I would wait for a sale to purchase. Yay - they still had some left. This foiled paper is a great buy at $10.00 and there are 80 sheets in this 8.5 x 11 pad -- 5 different designs in 8 different colors and two sheets of each one. I can get lots of front panels out of this stack! The only color I feel is missing is Red. The little foiled hearts on a red background would have been so great for valentines, but I just used Pink instead. These cards are for women, afterall. I cut my background panels in the pink heart foiled paper using a Simon Says Stamp Stitched Rectangle Die in the largest size. Next I cut the Love Text Block from Gold Foil Card Stock out of my scraps. That die came from Paper Trey Ink. I didn't want the die to compete with the background panel, so I cut a vellum panel to put behind it. The die is slightly larger than 2.75 x 3.75 inches so it was easy to cut the right size vellum panel for it. The inside sentiment is a combination of stamps from Winnie & Walter's The Big, The Bold & The Happy Stamp Set along with the custom Secret Sister stamp that I had made. On all of the cards I have made for this project, some include the Secret Sister stamp on the inside and some on the front. Just wherever I feel it looks the best. I'm very happy with how these cards have worked out. I have a few more to do for this series so I will be back soon with another project to share with you. Thanks for stopping by and I hope you have a fantastic day. I have a fast and easy card today that is part of another project I am working on. There was no stamping done on this card, but the die cuts took a little bit of time. The numbers are part of a set from some that I had from Quickutz several years ago called No. 73. There is not an alphabet to go with them and it took some time to figure out what my "sandwich" should be to cut, as these are wafer dies with foam attached so the normal cutting sandwich did not work. I've learned not to force that issue. To get these to cut in my Cuttlebug, I used an A plate, the Spellbinders Tan Embossing Mat, the precision metal adapter plate, a B plate, 3 pretty thin chipboard shims and another B plate. With all that you'd think it would have just rolled through with the A, C and B Plates, but it wouldn't go. New Years always makes me think of bling and sparkle and I didn't want this card to be any different. All of the die cuts are cut from gold glitter cardstock out of my scraps. The "happy" is cut from the Mama Elephant "happy" die. I used an embossing folder from Design Objectives Ltd. for the A2 card base that is cut from Bazzill Marshmallow and the tag is cut from Canson Bristol Smooth 96# watercolor paper using the WPLUS9 Love Showers Die Set. I cut a few stars out of some Quickutz Stars but you can use any dies or punches you have. I wanted a few sizes so I used stacking dies but I have a punch that cuts small ones that would have been cute also. I attached everything to the tag with Ranger Multi Medium Matte and then adhered the tag to the card base using foam squares. I think that about wraps this card up. It was quick to put together once I decided on the design and elements. Thanks for stopping by today and please feel free to leave a comment if you do! I'm going to try to make this a quick post, but we'll have to see how it goes! I sat down this morning to make a couple more Christmas cards and next thing I knew it, I was inking up a Ranger Mini Ink Blending Tool with one of my favorite colors - SU! Melon Mambo. I love that color - it's even delicious sounding. After I started, there was no stepping back and next thing I knew I had inked up the entire panel with Melon Mambo even though my intention was to use pink and coral or pink and yellow. Pretty soon I was channeling Laura Bassen on a recent Simon Says Stamp "From All of Us" release day where she made this card. Now I don't know much about Laura, but she does love her bright colors which is easy to see if you've looked at her blog, Doublestick Heaven, more than once! She loves any brand of inks that allow her to mix and blend and she does it well. I just happened to think that this bright pink was gorgeous and I knew I wanted to pair it up with some Gold Mirror Card Stock. I don't have much of that around because most of the time it simply is too bright to pair up with very many colors that I use, but it was perfect for this and there just happened to be a 2 inch wide strip on my table next to my Cuttlebug. For my card, I actually had inked up another piece of watercolor card stock with Calypso Coral Ink and I die cut that with my Joy Die. This particular die came from Paper Trey Ink. I have a few of their dies and I've been very happy with them. Anyhow, when I inlaid that coral die cut into the pink frame, I didn't really care for it but that is also when I noticed the Gold Mirror scrap laying on my table. So, it was a no brainer after that. I love pink and gold together, in any shade of pink but I'm fussy about my gold. Most of the time I use a more muted softly brushed gold card stock. I inlaid the Gold Mirror Card Stock using a little trick that I've seen Jennifer McGuire do which is to place a piece of Post-It Tape over the back of that area because it helps to hold the die cut in place while you set all the little extra pieces into your card front. You can also use this trick if you want to do ink blending on a die cut to keep from bending or crumpling it up. I chose this die because there were only 2 pieces to put in but also because with the Jingle Snowflake Border from Simon Says Stamp, it makes me think of the Christmas Carol, "Joy to the World". This particular card is being designed for a woman, so the pink is a good fit in that regard as well. I also place the Jingle Snowflake Border across the card front how and where I wanted for the inlay of that part but rather than cutting it through, I used my Cuttlebug Embossing Mat. This makes the imprint of the die, without cutting all the way through so it acts like a place holder. Your card will look as if you inlaid that die cut. All in all, a very fun technique. I just trimmed off the excess with my Cutter Bee Scissors. I love ink blending and there's no better way to do it than with a Ranger Mini Ink Blending Tool. Whether you have one that is actually that brand, or something you have made at home to do the same thing, it gives you a result that can't really be obtained any other way. You only need to remember to start with a light, circular touch and add more layers if you want a deeper color. Distress Inks seem to work particularly well for this technique, but I am using the ink pads I already have which are 95% Stampin' Up ink pads. I had never even used most of them until a few months ago. Stamping, like anything else you want to do well, requires practice. I think I've watched pretty much every Jennifer McGuire, Ink YouTube video because I think she is a champ at card making & techniques and in her videos she will give you little tips & tricks to achieve the same results. I don't get a perfect result every single time I try, but I used to tell people that I am not a stamper. That is no longer true. While I do love to use watercolor in my card making, I also really love heat embossing and I've found that I get far better results now that I've had some pretty consistent practice. I believe that if you want to be successful at something, you have to find someone who already is and then imitate them. Imitation is the most sincere form of flattery after all. The Simon Says Stamp Monday Challenge this week is "Holly Jolly" and I'll be entering this card over on that blog. I hope I've inspired you to try some new techniques and experiment a little with your supplies. Thanks for stopping by today! In just 10 more days, my husband's family (The Finger's) will be gathering for our annual holiday dinner. This is my husband's parents, all his brothers and sisters plus their spouses, all of our kids and their spouses, our grandkids which actually consists of one spouse now since our oldest grandson got married in October. As you can imagine, it is a very large gathering. We rent a lodge in NE Kansas which is near the home place and has 5 bedrooms and each year we take turns hosting. This year, my husband and I are the hosts. On Saturday evening, all of Eddie & Agnes' children and their spouses gather for dinner, catching up and having a spirited Chinese Gift Exchange with a twist for this year. I detest the White Elephant Gift Exchanges we have done in the past so I made sure that we were doing something more fun than taking home something you didn't want in the first place. Each couple usually brings a bottle of wine since we're in the lodge and not driving anywhere for the entire night. This year, each person was asked to bring their favorite bottle of wine or wine accessories for the exchange. We will be having a three steal limit. The 4th person owns it and it cannot be stolen again. We have a lot of thieves in the family when it comes to the Chinese Gift Exchange. Since I started making cards this year, I wanted to make sets of note cards for each of my sisters-in-law. I don't think any of them read my blog but even if they did, it would be hard not to figure out what I've been up to. Therefore, no pictures of the actual packages will be posted on here. I started that project in July by asking what their favorite color combination is. I've had most of them done for several months, but I really agonized over my choice for the other Vickie Finger. I guess because she loves my cards and has received several by now to send so I didn't want anything that looked too similar to something I have already made her. In the end I made two sets with her in mind and I went with my first instinct so I have another set to give as a gift. So last night I sat down to make some Gift Tags. I have some cellophane bags that came from Simon Says Stamp to put the cards into but they still needed a tag. I have some watercolor paper that I bought in a pad of 4x6 sheets that works great for watercolor, but not so good with adhesive. It is very fibrous on the back side and is not tightly pressed back there so for whatever reason it is difficult to adhere. The paper usually pulls away with the tape. So I cut up the last sheets of that for my tags. I wanted to do some ink blending and this watercolor paper is perfect for that. I also wanted to do some heat embossing after the ink blending, so I had to be careful to use my anti static powder pouch before inking up my images in Versamark. It took a while to do this because I like to Ink Blend and then put some shimmer spray on top of that to soften the color even more which meant speeding up the drying time with my heat tool. The spray I used for these is Dazzling Diamonds from Tattered Angels. I wanted something different than my usual favorite, Tsukineko Sheer Shimmer Spray. After I sprayed the tags, the ink blended even more for the soft color you see here. Next I needed to stamp my images that I wanted to heat emboss. I will say that I probably would never buy another cling mount stamp from Stampin' Up due to the fact that they do not stick to my acrylic blocks. They fall off unless I glue them on with Tombo Mono Multi. And I clean my blocks with rubbing alcohol so that there are no traces of oils. I clean the cling part with alcohol also, but it doesn't help. The stamps I used actually came out of two different stamp sets, but they worked fantastic together. The branch is from Watercolor Winter and the little square "A Gift For You" came from Beautiful Season. The tag came from the WPLUS9 Love Shower Designer Dies set and is 3 x 4.25 inches. I have another die that can create a reinforcement for the hole, but I didn't need it with the thickness of the watercolor paper. I carefully stamped each tag with the branch first and then the "gift for you" greeting 2nd. I just did one tag at a time since it was only two times of stamping. Then I sprinkled on Simon Says Stamp Ultra Fine Detail Gold Embossing Powder and heat set all 5 of them at the same time. I did watch carefully and brushed off any excess powder from the tags with a dry paintbrush (#4 Round) before I did this. Once I had those heat set, I colored in the leaves with Tim Holtz Distress Marker in "Pine Needles" and the holly berries in Tim Holtz Distress Marker in Festive Berries. After that was dry, I used Christmas Red Stickles over the top of the berries. I probably could have skipped the Festive Berries Marker, but I knew my berries would look really red under the stickles and it only took seconds to do each one. I wanted each tag to be a different color. I used Maliblue, Hollyhock, Teeny Bikini, and Thistle all from Simon Says Stamp and Garden Green from Stampin Up. I think I might have to do another coat on the Teeny Bikini colored tag! But this will give you an idea of how the color looks. Since the shimmer sprays are water based it really blends and softens the color of the water based dye inks. I used some sheer white ribbon for the ties which will be taped to the package backs and hanging loosely over the front. I have actually made several sets of Gift Tags this year but these are the first ones I've gotten to use. I hope you're getting all of your holiday shopping done and have a little "scrappy" time to yourself, too! I'll be entering these tags in the Simon Says Stamp Wednesday Challenge which is "TAG IT"! For once, a project I was already working on fits the weekly Challenge --Woo Hoo! Thanks for stopping by today. On the Simon Says Stamp Wednesday Challenge Blog the theme for this week is "Let it Snow". With this in mind, I wanted to create a snowy tree for my card. Where I live, when the snow falls, there's not many creatures stirring about and I get to enjoy the beauty of watching it snow. There is nothing so silent and peaceful than a full-on snowfall. That probably sounds goofy, but every thing is so still and quiet when it snows. Our next door neighbors have a whole lot more trees in their actual yard so they get all the beautiful cardinals. They always have food out for them also, but I still get to enjoy looking at them. For my card, I wanted to portray that stillness I feel when I see a heavy snowfall starting. So I chose to create a lone tree to symbolize that stillness. I started by stamping the base tree from the Stampin' Up Sheltering Tree set in Onyx Black Versafine and heat setting it with Simon Says Stamp Fine Detail Clear Embossing Powder on a Simon Says Stamp Surf Blue Paper using the Simon Says Stamp Stitched Rectangle Dies. Like Jennifer McGuire, I find black embossing powder to be a pain to keep from contaminating other projects, scraps, etc. So I use black ink and clear powder. I have black fine detail embossing powder if I need it, but I haven't come across an occasion so far that has required that. Once I had heat set that, I came back in with the same tree stamp and some Delicata Silver Shimmer Ink slightly offset to give the impression of snow sticking to it and heat set that with clear embossing powder as well. Next I used a white pigment ink (from SU!) and stamped the leaves of the tree with that to make them appear full of snow. In real life, that doesn't happen too often, but Live Oak Trees don't lose their leaves, so that is the memory I am referencing in this particular case, *wink*. I used the same leaves to stamp my background snow, not re-inking and using 2nd, 3rd, and 4th generation stamps. My White Pigment Ink is really juicy right now because I just re-inked it not long ago so it was very easy to get multiple generations out of it. Once I had all of that stamped in white Pigment ink, I added some Judikins Iridescent Sparkle Embossing Powder to it to make it sparkle like real snow does. I cut the snowy slopes using the Mama Elephant Landscape Trio Dies and also stamped that a bit with the same leaves stamp to add a bit of white ink to them with more of the Iridescent Sparkle Embossing Powder. For the greeting, I cut some of the Surf Blue Paper with a label die, cut that in half and used one of the sentiments from Mama Elephant's Jingle Greetings, heat embossing Ranger Liquid Platinum Embossing Powder. The Liquid Platinum is a warmer color than silver. Lastly, I assembled my card using a top folding card base. I made this card yesterday along with the one from my previous blog post, but I couldn't seem to think through writing the post because my "puppies" (as I call them) were demanding attention. I snuck out of bed this morning while everyone else was still sleeping so that I could get this post written without interruption. While I do plan to take some time this weekend to get some of my Christmas Cards ready to mail, I received my Double Scoop Gelatos this week that I had ordered on a phenomenal Black Friday Deal and my goal is to have time to play with them this weekend. Therefore, I'll be back as soon as I can with another project. Thanks for stopping by today. I have a scrappy friend who lives in Belgium and is at University studying to become a Kindergarten Teacher. She has a huge following, especially on YouTube where she has more than 8500 subscribers for her more than 120 videos. She is only 18 years old but has been making cards since she was 12 years old. Her's was one of the first YouTube videos I watched when I started making cards this past Spring and I've followed her ever since. Now that my friend has started college, there are many projects to make as part of her education and she doesn't have as much time as she did before so she is taking a break from weekly videos and blogging. I still haven't mastered shaker cards which was the first video I saw her do. But I still remember the sound of her voice as she told us on the video that the card she had made was going to be the one she gave to her parents because she adored the cute little critters. Subsequent videos with critters are among some of the best she has done and she is the queen of shaker cards! She is also known for her love of and ability to duplicate soft colors. I started by stamping the little penguin on Canson 140# Water Color Paper from the WPLUS9 Winter Pals Stamp Set with my lightest gray ink, Smoky Slate, and heat embossed him with WOW! Pearl Embossing Powder. When you use the Pearl, it picks up the underneath color - so paper color or ink color. With dye inks, you have to be really quick with the embossing powder, but you can do it. I just stamp each item one at a time so I can get the embossing powder on there and then I heat set everything all at once. For the little bear and the sled, I stamped in Sahara Sand Ink with WOW! Pearl Embossing Powder as well. The little pond was first stamped with Versamark and then heat set using Iridescent Sparkle Embossing Powder. I also went over the little pond with a swipe of Versamark so it would take the Iridescent Sparkle Embossing Powder over the whole surface to make it seem icy. I used the companion dies for all of the cutting. I detest "fussy cutting". Some people actually think it is therapeutic, but I am not one of them. Once I had all of my Copic coloring finished and everything cut out, I used Simon Says Stamp Surf Blue Card Stock to cut Simon Says Stamp Stitched Rectangle panel for my card front. I stamped the "Merry and Bright" from the Mama Elephant Jingle Greetings Stamp Set and heat embossed it using WOW! Metallic Platinum Sparkle Embossing Powder. The Platinum color is a bit warmer than Silver. This Mama Elephant handwriting belongs to one of the owners of Mama Elephant and it is my favorite! I have several Mama Elephant word dies in the same font. I still don't feel very comfortable with Copic Coloring but I think these little critters are pretty passable. Copics are another medium that you have to learn to walk away from for a bit to see how the color comes out. Since they are alcohol based, they dry pretty quickly allowing the color to absorb into the paper. I used C1, C3, C5 & C7 to color the penguin and W1, W3, & W5 for the bear. Surprisingly, I did not use any black on the penguin except for a black glaze pen on the eyes. For the white parts of the face I used a tip to tip technique using a colorless blender with C1 for a minimal amount of gray shadow. I used clear Wink of Stella on the white parts after he was colored. When I first started the penguin, I was pretty sure that I had ruined him with my first strokes of the gray, but it came out alright in the end. Copic Markers come in two types -- Sketch and Ciao. I have all Copic Ciao Markers but I see most people using Copic Sketch Markers. I do not know what the difference is. Some people used to say that Ciao Markers couldn't be refilled, but they can, so I still don't know the difference. I've had my markers for several years so I guess it just not that important to me to know the difference. Way back when I got mine, I got what was recommended by a couple of guys that were Certified Copic Instructors. I don't use mine often enough to feel the need to know. I much prefer watercolor for most of my images but I couldn't get these little pals colored in a way that I liked, so I switched mediums. The theme this week at Simon Says Stamp's Wednesday Challenge Blog is "Let it Snow" and I'll be entering this card. A few weekends ago my husband and I traveled to Kansas City for a car show where his brother had a car entered into the competition. While we were there, we walked around a lot and saw the others cars that were there, but we also had a lot of time just sitting around. I knew it would be that way, so in my quest for a great Christmas Card, I had stamped several card fronts onto Canson 96# Bristol Watercolor Paper to take with me to watercolor. This Canson paper is super smooth and much whiter than my Canson 140# Cold Pressed Watercolor Paper. I put those watercolor panels into a stamp pocket to keep them clean, grabbed a water brush and about 5 different greens in Distress Markers and in Zig Clean Color Real Brush Pens so I could think about how I wanted to watercolor them and in which shade of green. I had kind of mocked up what I thought I would do for this card and even had one die cut in the gold glitter paper for my prototype. In the end, I didn't actually color any of these at the car show and only colored all 17 of them yesterday. I didn't stick with one color or type of marker for these, choosing instead to do each one however I saw it at the moment I was painting it. So, there's a variety of greens in these. The newest Distress Marker from Tim Holtz is "Lucky Clover" and I thought I would use that color for the images. Lucky Clover is a gorgeous color of Kelly Green but it's really not a deep enough green for the holly leaves in this Hero Arts Holly Jolly Stamp Set. There is a coordinating Holly Jolly die cut for this set as well, but I didn't ever plan to use it for this card. I knew I wanted the Mama Elephant "Merry" die using DCWV Gold Glitter Card Stock, so I used Simon Says Stamp Ultra Fine Detail Gold Embossing Powder for the holly leaves and the "& Bright" part of the sentiment. If I would have thought of it sooner, WOW! Metallic Gold Glitter Embossing Powder would have been beautiful also. But I'm okay with how it looks. I was hurrying when I stamped and heat embossed these panels. I tried several other green family distress markers including Forest Moss and Pine Needles but ultimately I used Zig Clean Color Real Brush Pens in Green and Dark Green. There you have it - no need to buy all of the colors of those pens because you can make any color you want from the basic set of 36 Pens. In fact, I have purchased 4 additional markers outside of that set and I have yet to find an image that they are suitable for. Persian Green is one such color but in reality it is a teal color and not green at all. There are also holly berries included in the dies, but I stamped these with Versamark and heat embossed them with WOW! Primary Apple Red Embossing Powder. After I had assembled all of the card fronts to the card bases, I went over the berries with a coat of Glossy Accents. That was about 8 p.m. last night so with the way I had them lined up, they could dry overnight. Any time I try to hurry Glossy Accents, I always mess them up by sticking a finger or some such into them! I used Ranger Multi Medium Matte to adhere the "Merry" die cut to the Simon Says Stamp Stitched Rectangle watercolor panel. I really like that there is so much white space in this design. I hadn't known until recently that I have a strong preference for really bold graphics. The Mama Elephant dies are my favorites among my dies and are the handwriting of one of the owner mom's. I still need to stamp a sentiment on the inside of these cards before I start sending them out but these are primarily for immediate family. This is a clean and simple design that I am very happy with. I'll be entering this in the Simon Says Stamp Wednesday Challenge which is still "Anything Goes" but already has 738 other entries! Thanks for stopping by today. I have several projects in the planning stages so I'll be back soon. When I had to sit down this morning and put a couple of sympathy cards together quickly, I was really happy that I had some extra background panels from yesterday's "experiments". Honestly, this is the first time that I have made a sympathy card. I try to keep a few on hand from the store because it is something you will need sooner or later. But as the father of one of my best friends passed away, I wanted something that I had made to send to her and another one for her mom. I didn't photograph the latter, but this card was super fast to pull together. I cut the background panel that I had created yesterday with the Hero Arts Leafy Vines and SU! Garden Green Ink using my largest Simon Says Stamp Stitched Rectangle. Next I stamped my sentiment on a scrap piece of the watercolor card stock because I knew it would match the white in the background panel. I used WOW! Rich Pale Gold Embossing Powder to heat emboss this sentiment from Hero Arts & Simon Says Stamp Exclusive Prayers Stamp and Die Cut Set. I cut the ribbon strip to about the size I wanted it and used a SU! punch that I have to cut the banner ends. You lose about an inch when you use that punch so I cut that end first. Then I laid that strip into the stitched rectangle die, lining up the stitching lines and cut the other end of the banner so it would line up with my card base. I just used a bit of masking tape to hold it in place while I cut it. I mounted the background panel on an ivory top folding card base. This was super easy to do and made for a nice, classic looking card keeping with my overall style of classic and elegant. Thanks for stopping by today on my super quick post. Enjoy your Sunday! In my wish to make a birthday card for one of my sisters-in-law that is different from anything I've made her before, I decided to try iron off embossing; a technique that I saw Jennifer McGuire do quite a few months back. Now, I don't know about you but I only get my iron out if I need to iron something and that only happens about once a year, but I made a special effort to try this technique today because I have quite a few background stamps. Not all background stamps are suited to this technique, but I found a few that I think worked very well here. I stamped each background using Versamark Ink and Simon Says Stamp Fine Detail Clear Embossing Powder. I really like the Simon Says Stamp brand as it's a larger sized container than some other brands and melts very well. I had previously cut my Canson XL 140# Cold Pressed Water Color Paper into 4.25 x 5.5 inch panels. This size is perfect and allows me to die cut them with a scalloped rectangle or stitched rectangle with a minimum of waste. You need a stamp that has quite a bit of surface area for this technique to work well. Two of the background stamps I used here are Just Rite Cling Stamps and one is the Leafy Vines from Hero Arts that I used for my Grandson's Wedding Card. For all of the backgrounds I used a Ranger Mini Ink Blending Tool to apply one or two colors of ink in a circular motion for a smooth blend although I don't think it really matters since I'm spritzing them with a solution of water and Perfect Pearls to get the softly colored backgrounds you see in these photos. I love the magic that comes from doing techniques and watercolor is my very favorite technique of all. Heat Embossing is my 2nd favorite and this technique combines both of them which is a win-win for me. Most of the ink pads that I have are Stampin' Up! and that is what I used for these backgrounds. The colors I used are Pacific Point, Garden Green, Blackberry Bliss, Melon Mambo, Calypso Coral, Daffodil Delight and Smoky Slate. Once I had inked up these panels, I spritzed several short bursts (7-8) of the Perfect Pearls Pigment Powder & Water solution. I did them one at a time rather than all at once so I could (sort of) control the outcome (a.k.a. sopping up any excess water with a tissue). As each of the panels dried, I took them to my ironing board with a sheet of plain printer paper. I turned my iron on to a no steam, high setting for cotton. Laying the printer paper on the top so that it can absorb the embossing powder that you are ironing off, I went over each panel with a clean sheet of paper. After I went over it very well one time I would fold the paper in half and do it again just in case there was any area that I had missed. This results in a clean, matte finish design wherever there was previously embossing powder. The soft watercolor background is a lovely look and not one that could be easily obtained with regular white card stock. It would be hard to get enough water on it to really blend the ink. After I was done experimenting, I used the Mama Elephant Birthday Wishes Stamp Set to stamp my greeting on some more watercolor paper that I had heavily ink blended with the same inks as I used for my background panel. I couldn't decide between WOW! Rich Pale Gold or WOW! Metallic Gold Sparkle Embossing Powder so I stamped one of each to choose. As you see, Gold Sparkle won out. I'll save the other one for a different card. I also inked up a strip of watercolor card stock in the Blackberry Bliss ink and put WOW! Clear Sparkle Embossing Powder on it to be able to cut the darker hearts for my card. After I cut them out, I put some Wink of Stella Clear Shimmer on them and topped them with Glossy Accents once my card was assembled. I used the Simon Says Stamp Stitched Rectangles to cut my water color panel. I used a slightly smaller one for the "Happy Birthday" panel repositioning it once after my initial cut to get a different size than intended. My square die wasn't quite large enough so I just altered the rectangle die by lining up the stitch marks and cutting it again where I needed it to be. I hope that makes sense! Be sure to use a bit of Post-It or masking tape to keep the die in position while cutting that second time through. As I always do when I am experimenting with a new (to me) technique, I'll save these other backgrounds and the sentiment for another time when I need to pull a card together quickly. Single layer cards go through the mail easily even though the hearts have a bit of dimension on them and my goal is for it to always get there! I will be entering this card in the Simon Says Stamp Wednesday Challenge which is "anything goes". Thanks for stopping by today! I'll be back with another project very soon.